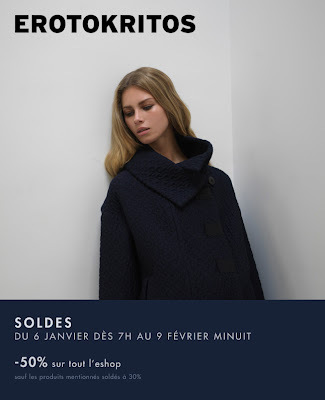 We are pretty close to the opening of the Winter sales, well at least in France. I won't be in Paris and there is no chance I could find something to buy in my small town. Well I'm connected with all the e-shops in the world... but you know, I'm old school and like to try clothes and shoes on in a store. But what if? I'll do some virtual shopping and let you know what I'll find. Let's start with the 50% off on Erotokritos e-shop that will begin at 7 am on Wednesday. Je vais commencer avec les 50% sur le e-shop d'Erotokritos qui débutent ce mercredi 6 à 7h.